Last post we covered the ins and outs of eating potatoes when you’re living a nutritarian lifestyle. There’s undoubtedly a wrong way to eat potatoes (fried in oil or drenched in butter, brown sugar, bacon bits, sour cream or cheese). But on those rare white-potato-eating occasions, your best bet is to load them up with as many GBOMBS as possible! And let me tell you, there’s no better way to pack in your dark leafy greens for the day than with the aid of a fluffy, savory, comforting, baked white potato! 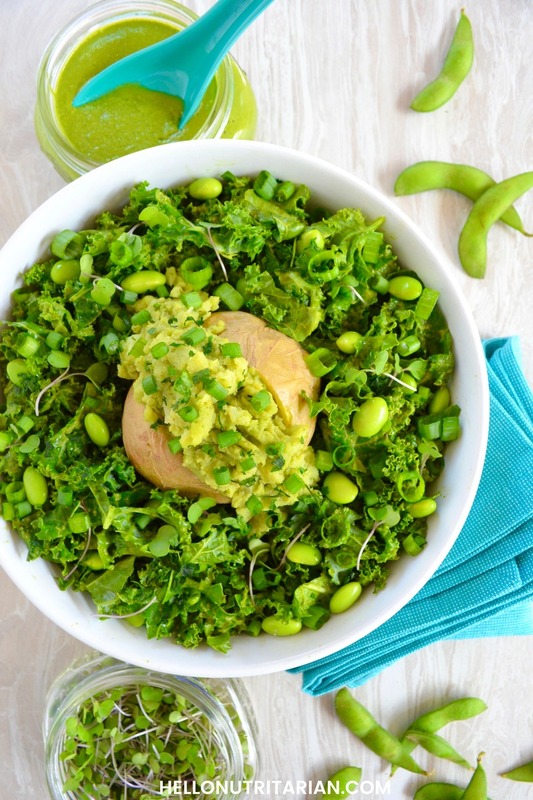 This No-Oil Pesto Baked Potato Kale Salad hits all the marks for nutrition, taste and satisfaction! Let’s be honest, the key to a kickin’ salad is the dressing. 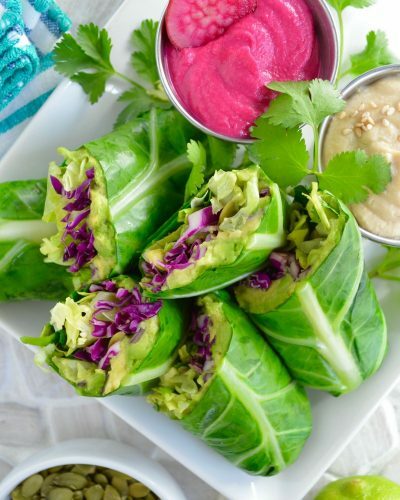 And when you’re aiming to eat 2 pounds of veggies daily your most powerful tool as a nutritarian is your arsenal of low-sodium, oil-free dressings, dips sauces and slathers! That’s why I’m so excited to bring this No-Oil Spinach Pesto Dressing into the fold. This dressing was literally made for this salad. I wanted to seriously ratchet up the greens factor for this potato so you’ve got fresh herbs and spinach making up the dressing base. Raw pine nuts serve as your healthy, whole-food fat and provide plenty of plant protein to boot! The notes of lemon and pepper work as a contrast to the warm, fluffy potato and make the raw kale sing. There’s no denying the fact that Dr. Fuhrman sees white potatoes (Russet, yellow, red) as the least-preferred high-starch vegetable. But in The End of Heart Disease (p.35), he does concede that if you “take care to eat only a limited amount of white potato and to eat it with greens, beans, nuts and seeds” it can work in your nutritarian lifestyle. So, we’ve got the seeds covered in our dressing (plus a few more greens for good measure), now it’s time to turn this white potato into a green-machine! The base of this No-Oil Pesto Baked Potato Kale Salad is a bed of raw curly kale “ribbons” (or sub baby kale). That’s just a fancy way of saying you cut the kale leaves into long skinny strips. 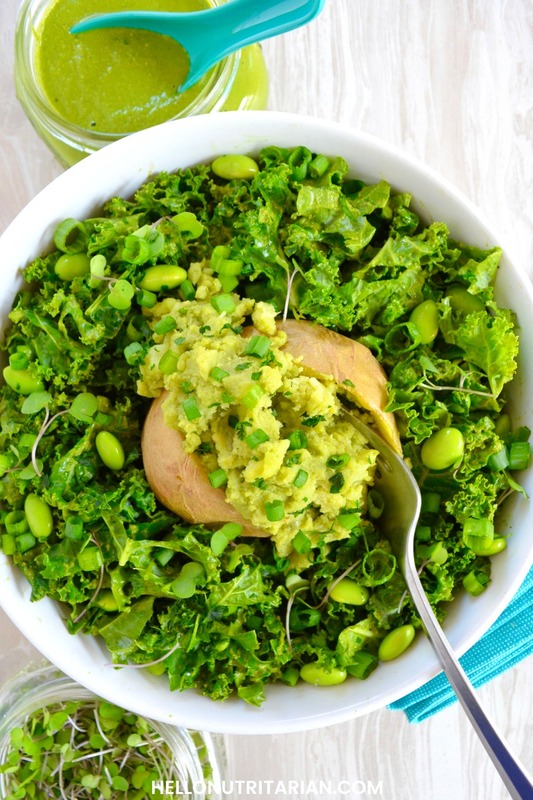 Then we go even greener by adding some baby kale sprouts (or sub defrosted frozen broccoli) to our potato salad. That’s a motto I live by, my friends! Because avocado is probably my favorite nutritarian fat source. And when you mix avocado with potato with pesto, well let’s just say that’s pretty much what unicorns eat! Let’s face it, this No-Oil Pesto Baked Potato Kale Salad is chock-full of amazing-for-you-greens. 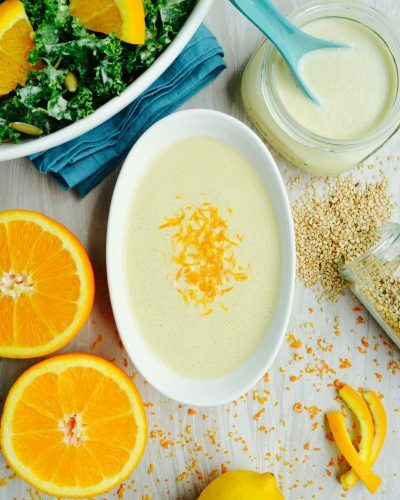 But in order to finish those 2 to 3 cups of raw kale per person (because WE LOVE GIANT SALADS!) you need some extra avo-incentive! That’s why we’re mixing all that soft, fluffy baked potato goodness with our magical avo and a bit of our Pesto Dressing and reloading all that green goodness back into our little white potato shell. You’re Eating Your White Potato Responsibly Now! 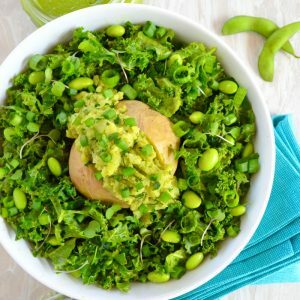 With a few more nutrient-dense add-ins like edamame and green onion, you’ve got a bona fide nutritarian baked potato on your hands! And the result is simply delicious! I can’t tell you satisfied I felt after eating this salad 4 times (yes, that’s how many times it took to get this recipe juuust right–that’s my story and I’m sticking to it). The contrast in flavors and textures is spot-on and I don’t know about you but eating a white potato just makes me feel like all is well in the world. 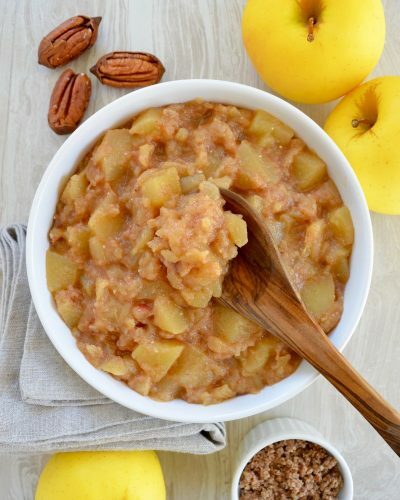 If you're going to eat a white potato on Dr. Fuhrman's plan, this is the way you want to do it! You can elevate the nutrient-quotient of the humble white potato with this all-things-green baked potato salad recipe! 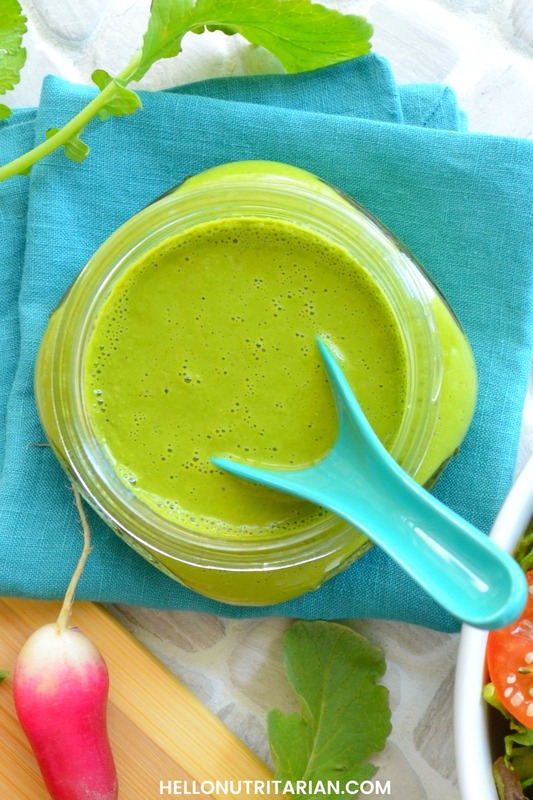 Start by making a batch of No-Oil Spinach Pesto Dressing in your high-speed blender. Pierce your potato several times with a fork. 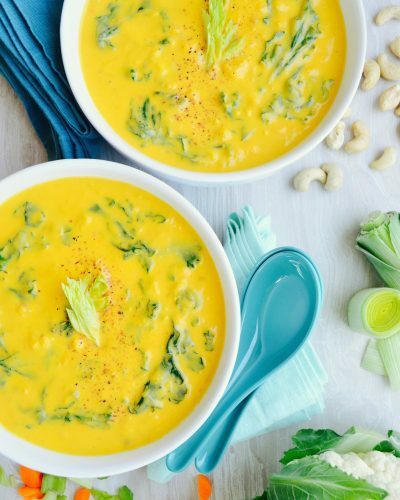 Place in a microwave-safe bowl or dish and cook until fork-tender (about 3 to 5 minutes depending on your microwave settings). Set aside. 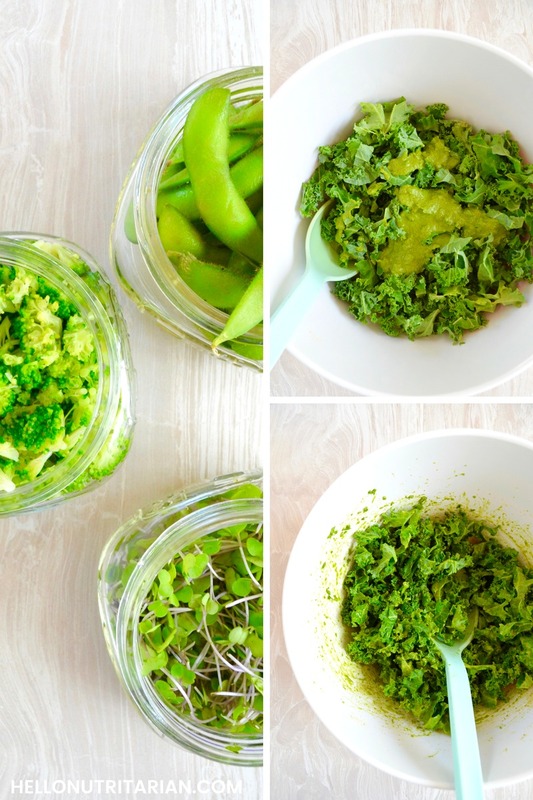 Wash and dry your curly kale (or sub baby kale) and cut into ribbons (skinny strips). Place in large mixing bowl and mix with 1/4 to 1/3 cup No-Oil Spinach Pesto Dressing. Use 1/4 cup for 2 cups of kale ribbons or 1/3 cup for 3 cups of kale ribbons. Place dressed kale ribbons in a serving bowl. Top with sprouts, edamame and green onions (or corresponding substitutions). Cut your cooled down potato down the middle (but not all the way through). Scrape out the inside of your potato with your fork. 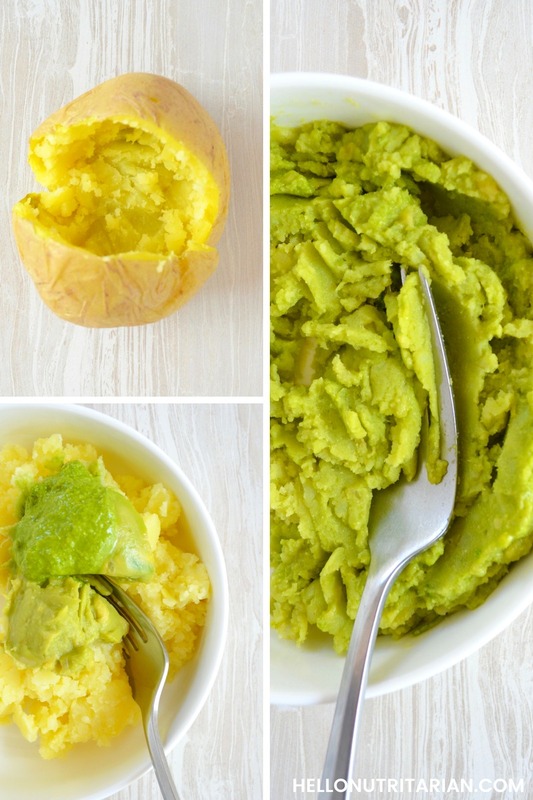 In a small mixing bowl add mashed Hass avocado, potato flesh and 1 tbsp. reserved Pesto Dressing. Arrange hollowed potato skin on top of your salad and re-stuff with potato flesh mix. Add more green onion and optional parsley for garnish. Serve immediately. You can eat this salad with the potato completely cooled down or warm. If you need to rewarm it after adding the avocado and dressing to the potato flesh, just pop it back in the microwave for 20 to 30 seconds. If you give this No-Oil Pesto Baked Potato Kale Salad recipe a try I’d love to know what you think–please leave a rating and comment below!